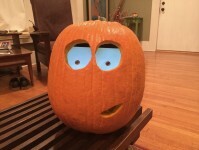 Meet Gourdy, the world’s first sentient pumpkin! UPDATE: GOURDY 2.0 is now live! Details and a new post shortly! 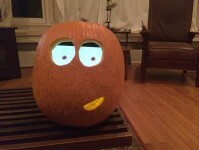 Previous post: Meet Gourdy, the world’s first sentient pumpkin. Ok, not quite sentient, but still really cool. Gourdy is an early prototype for my digital-puppetry jack-o-lantern system. Eventually he’ll be a fully interactive / reactive magic pumpkin. For now he’s made of a 7″ tablet running a looping quicktime movie. He’s dirt simple to build, and you can build him too! 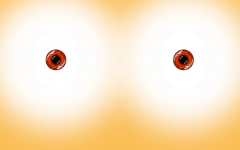 Here’s how: Step 1: Download one of these eyeball animations to your tablet Here’s a couple of animations I made – a friendly one and an unfriendly one. You’ll have to get them to play in a loop. Video Loop Player for iOS or Video Looper for Android will get the job done. 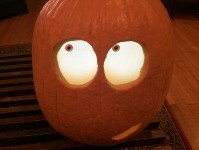 Gourdy has big round eyes, but your pumpkin doesn’t have to. Just make sure that you choose an eye shape that works well with the animation. You can try out designs by laying a piece of paper directly on your tablet’s screen and drawing eye shapes. This paper will also make a great template when you carve the pumpkin. Choose a pumpkin that’s bigger than you’re used to. The bigger the pumpkin the better. Tablets have more of a border around the screen than you think, and it’s a tight fit. Pumpkins with flat fronts are best. 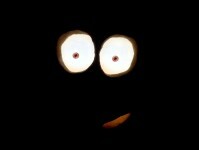 Use an LED candle instead of a real candle, unless you like the smell of burning electronics. Make your own eyeball movie! 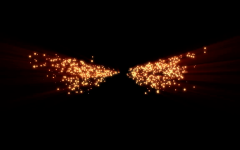 There’s all kinds of free animation software out there. Why not make yours a cyclops? Or give Gourdy expressive eyebrows or some lovely eyelashes? The possibilities are endless. TAKE THE TABLET OUT OF THE PUMPKIN BEFORE IT ROTS!